The Myth: “Odysseus was a hero of great wit and intelligence. It was his idea to penetrate the walls of Troy by giving the Trojans a large wooden horse (eventually known as the Trojan Horse) that carried a band of Greek soldiers within it. The Message: “If you have been working toward achieving a considerable goal, this card assures you that you can do it. There will be many challenges along your way. Distractions, temptations, and battles are inevitable in every hero’s quest, but only those willing to face the dangers and defeat the monsters experience victory. Those who don’t get distracted or give up when the journey gets too rough, those who face every challenge head on, will assuredly reach their goals. Decide today to be that person. Have heart and courage. Be heroic. 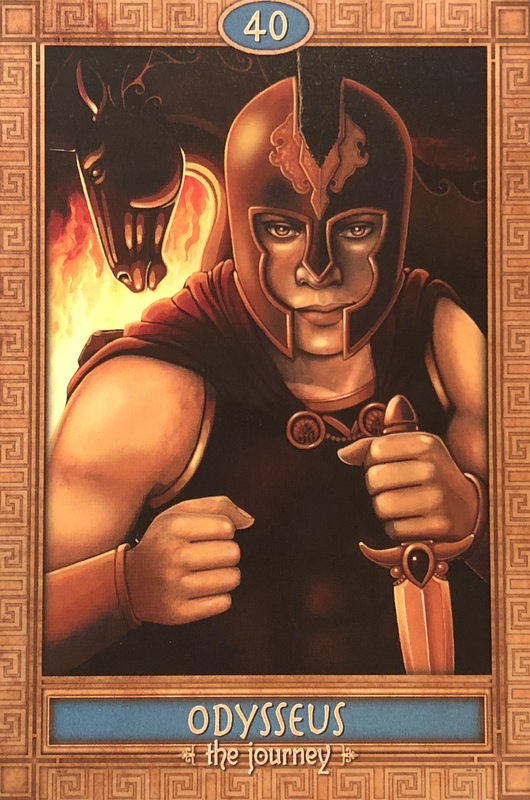 Odysseus fought a ten year battle at Troy and took another ten years to fight his way back home, but he eventually accomplished the seemingly impossible. Yet it was not the accomplished task that made Odysseus great – it was the journey itself. It is very important to stay your course now. Let nothing distract, discourage or defeat you. There may be challenges ahead, but know that they are manageable and that you have the strength and resources to accomplish your goal. Do not let anyone talk you out of your dreams, especially your own fear! We can be our own worst enemies when things are not going smoothly, and we can give up just before we make a major breakthrough. Take this message as a sign that you are on the right track, and perseverance is key. Action comes in many forms, and forward momentum starts from within. Self-belief and conviction are important now, so do not give up on yourself, know that you have got this. Be careful who you confide in at this time, well-meaning or not, other’s fears can throw you off-balance with their doubt and you must preserve your energy. If you feel like you need advice go to someone who inspires and uplifts you; someone who has beaten the odds and succeeded in the area you are pursuing. Do not take advice from someone who is stuck themselves! Think of negativity and fear as the Trojan horse, coming in stealthily to steal your victory and joy. Be vigilant and only allow clarity, focus and positive intention. Victory is yours and it will come in more than just the goal achieved. It will come in the mindset that you will have access to once you realize just how capable you are. Although you may be settled on one main goal, this will turn out only to be a stepping stone on a powerful journey of self-discovery and expansion. Embrace the journey as much as the destination, for what you learn along the way will be invaluable and transform the way you see the world and your place in it.